A proposed cross section of Yonge Street at Mel Lastman Square presented in 2016. For more than five years, Councillor John Filion has been attempting to secure city funds to rebuild the road and sidewalks on Yonge Street between Sheppard to Finch. The deteriorating pavement is almost fifty years old and most areas of sidewalk are in a sad state. As one of the city’s main centres, our community deserves much better. In 2016, staff from several city departments finally came together to plan a reconstruction plan; while they were at it, they began thinking about the future of this stretch of Yonge. Was it enough to replace old concrete with new concrete – or should we be thinking about something much more ambitious? The opportunity only comes along once every half century. A design charette in 2016 encouraging the public to weigh in. 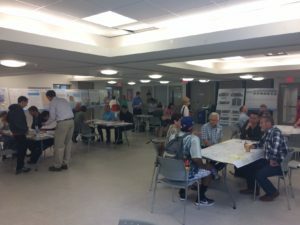 Staff from several departments began developing a series of options and sent notices to all local residents inviting them to participate in a visioning exercise. Several hundred took part. Out of that came Re-Imagine Yonge – a proposal to create a neighbourhood-oriented main street, with wide boulevards, outdoor cafes, trees and flower boxes, and bicycle lanes separated from the street. 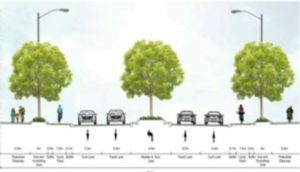 To make room for all this, the proposal included removing a curb lane in each direction. Wider sidewalks and more decorative plantings would draw more people to the streetscape. Wider boulevards would create more space for our ever-increasing population – room enough for young people, families, parents pushing strollers, residents with mobility issues. 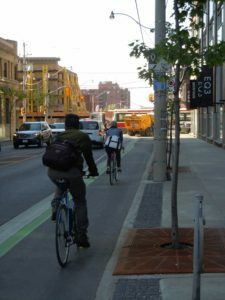 The narrower street would also create a safer environment for those crossing Yonge, especially those who now find it difficult to get across six lanes of traffic on a green light, or those who don’t always cross at lights. 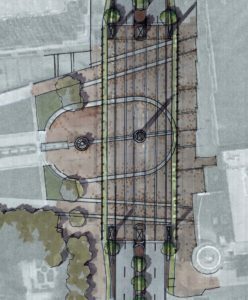 There would be enough space to locate more benches, plant trees that will grow, and make room for other decorative plantings that will enhance the area. We’re hoping to use Re-Imagine Yonge to spur the creation of a Business Improvement Area (BIA), through which the city provides matching funds to groups of business owners who want to beautify their area. Other parts of the city, with thriving retail, have BIAs. More sidewalk patios and cafes would be a new draw for the community. A main street should have enough room for outdoor restaurant seating without squeezing pedestrians into a narrow portion of sidewalk. The current width of the Yonge sidewalk, in most areas, makes it difficult to accommodate both. Re-Imagine Yonge would create opportunities for pleasant outdoor space where neighbours and friends could meet one another for lunch, dinner, a glass of wine, coffee and dessert. When more pedestrians think of Yonge as their main street, they’ll l bring more business to its stores and restaurants. Increased business should, in return, attract new stores and restaurants. This cross section proposed between Sheppard and Finch Avenues envisions a completed centre median. At the time of amalgamation in 1998, the City of North York plans to extend and improve the Yonge Street median were put on hold. The median was designed to help regulate traffic, provide a halfway haven for those who don’t cross at lights, and to visually break up the swath of concrete. Now there is an opportunity to fulfill the original vision. This sketch envisions extending the design of Mel Lastman Square into the streetscape to make the space more versatile for community events. Gathering spots are important to the life of any community. Mel Lastman Square currently serves this function, but it too could be freshened up. An additional element of the design preferred by staff and residents would provide better integration of public places and the sidewalks in front of them. In addition to to Mel Lastman Square, other spots this could be done include the space in front of the Joseph Shepard federal government building to the south and Olive Park to the north. Grade separated cycletracks would allow cyclists of all ages and abilities to move safely through the community. 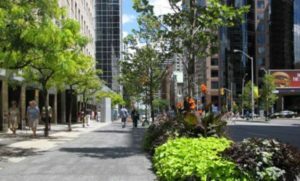 An important component of Re-Imagine Yonge is the possibility of adding a bicycle lane, located at the same level as the sidewalk, but separated from pedestrians by trees and plantings. A single lane, moving in the same direction of the traffic, would be located on each side of Yonge. The idea is to provide a safe cycling space that could be used by local families in addition to providing a vital link for more avid cyclists. For the latter, the city still needs to develop connections to the north and south. A component of any cycling plan would be additional bicycle parking, and possibly bixi-bike stations, especially near subway stations. In 2017, City Council asked staff to examine the possibility of placing bicycle lanes on Doris Avenue and Beecroft Road – instead of on Yonge. The results of that analysis are expected in the fall of this year.